After a busy day at work, there is nothing better than a good night's sleep in a comfortable bed. However, returning to a bed that may contain a substantial amount of fungi can cause you more stress. 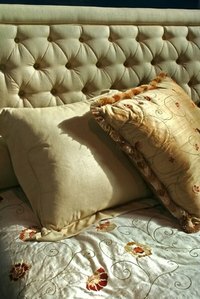 According to Science Daily, your pillow may contain millions of fungal spores. These fungal spores can lead to numerous respiratory issues, as well as exacerbate preexisting conditions such as asthma or allergies. Protect yourself and your family from these harmful spores by keeping your bedding clean with natural, non-toxic options. Purchase bamboo sheets and pillowcases rather than traditional cotton sheet sets as an easy preventative option for keeping your bed free of fungi. Bamboo bedding is an organic, natural, environment-friendly alternative. According to a study on bamboo by China Agricultural University researchers Wang and Ng in 2003, the bamboo plant contains an antifungal protein called Dendrocin. Dendrocin naturally wards off the accumulation of fungi. In addition to its anti-fungal properties, bamboo bedding naturally wicks away moisture, making this option ideal for hot summer nights. Soft and comfortable, bamboo bedding can be found in various styles and colors to match your bedroom decor. To prevent the spread of fungi and its harmful effects, try using an anti-fungal spray like MesoSilver. MesoSilver is non-toxic and contains natural colloidal silver, which kills bacteria and fungus upon contact. To use, wash your bedding with hot soapy water, rinse and dry. Spritz the spray on your sheets, pillow cases and mattress. Let your bedding dry completely. You can also use this spray in the bathroom or kitchen. Before using this anti-fungal spray, be sure to read all directions and warnings. Noted for its healing properties for various skin conditions like acne, tea tree oil can also keep your bedding clean and free of bacteria build-up. A natural fungicide, tea tree oil kills both bacteria and fungi without any harmful chemicals. You can use this natural option by purchasing tea tree oil at your local health foods store. In a spray container, add three to four drops of tea tree oil to water. After washing and drying your bedding, spray your tea tree oil mixture on your bedding to kill any bacteria or fungi. Let dry completely.